YOUR NAME + DVD + CD · Your name will be listed among other FIVE SAX friends who made DVD production possible. Additionally you will receive a signed copy of the DVD «Sax Voyage» and the CD «Five Sax at the Movies! 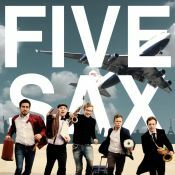 In 2012 five saxophonists converged in Vienna from Italy, USA, Belgium, Poland and Chile. United by a modern conception of virtuosity and the incessant urge to push the limits of performance, a new ensemble had arrived. After an unforgettable year of running from the police and dealing with the angry shopkeepers the time had come to take their act from street to the stage.